Life in the USSR, circa 1951, wasn't all gulags and long lines for sausage rations. Nyet! 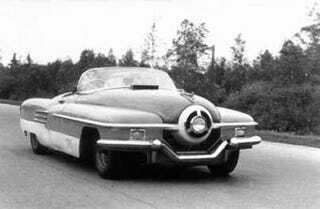 Turns out some of Iosif Vissarionovich Dzhugashvili's designers at ZIL/ZIS were hard at work coming up with the too-jaw-droppingly-awesome-for-words ZIS "112" prototype. Look at it. Look at it! That 50-Stude-zonked-on-Siberian-fly-agaric face! Had they been on the ball, the Commies could have seduced an entire generation of DA-hairstyled flathead-Ford-driving hoons away from their Detroit Iron and into chopped-and-channeled ZISs. The small-block Chevy would have been a footnote in automotive history! From there... well, you can see how the Cold War might have ended differently. Comrade.